Wasabi is a hot and tasty herb which is full of zinginess and flavour. Popular in Japanese cuisine as an accompaniment to sushi, this wonderful plant is now being grown fresh in County Armagh, Northern Ireland. Most commercially available wasabi contains very little of the real thing, if any at all. 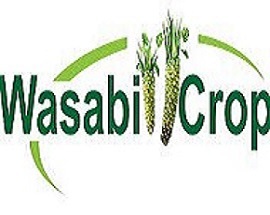 Wasabi Crop can supply fresh rhizomes including the herb leaf and stems. The rhizome can be grated for the absolute freshest, peppery hit with your favourite food. This is a genuine real root-to-stem crop. You can really enjoy all of it. Wasabi is crammed full of essential vitamins and minerals too. Contact the company directly for details of how much to order; how to cook with it and how to store it. Chefs and domestic customers are welcome to get in touch. Growers and Sellers of Fresh Wasabi Rhizomes, Leaves and Stems. Mazuma Wasabi, Daruma Wasabi and Green Thumb Wasabi including all leaves and stems for each variety.